Microsoft and Dropbox have been working on interoperability features together since last year, and yesterday they finished integrating Dropbox on the web and Office Online, Microsoft’s freemium suite of productivity tools, like Word, PowerPoint, and Excel. The integrated features are available to Dropbox for Business customers who also have an Office 365 license. Free tier Office Online users, and users of Dropbox Basic and Pro, have access as well. Let’s check out the features. When you go to log in to Office Online, you will see a prompt for adding a Dropbox account to the user interface. Likewise, when you’re in Dropbox, a Word (or PowerPoint, Excel, et cetera) button appears in the preview file online, and you will be able to make edits right there in the preview. These features eliminate several steps. Before the integration, a user would need to download the file from Dropbox, open up Office software—if it was even on the device they were using for Dropbox—make the edits, save the file, and re-upload it to the Dropbox. You might think this is no big deal since you could simply use OneDrive within Office 365 to the effect. While this is true, the larger story here is the way Microsoft is expanding its services horizontally, entrenching itself in cloud and mobile services that are accessible by a range of devices and platforms. Dropbox has 300 million users, and it is widely used in a business capacity. Likewise, Dropbox users in return get a widely-used productivity suite that is usable inside their application. Dropbox for Business users already have access to Dropbox Badge, a feature enabling users to collaborate on projects created in Microsoft Office applications. This takes that useful tool a giant step further. 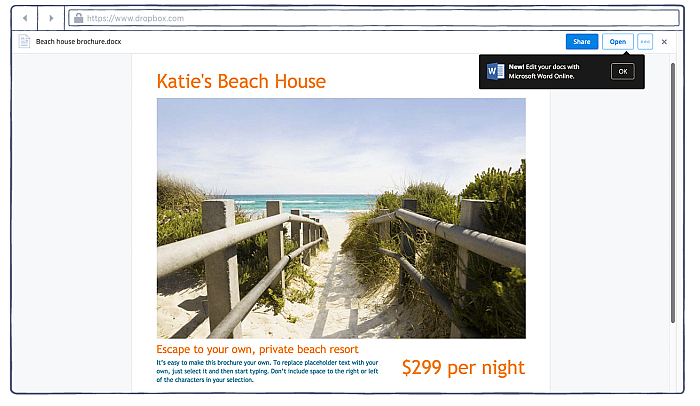 Last week, Dropbox announced it enhanced web browser preview functionality promising faster load times and better looking previews across a slew of devices. That’s how the partnership began back in November; users were offered the ability to edit Office documents within the Dropbox mobile app, and Dropbox integration for Windows tablets and Windows phones. 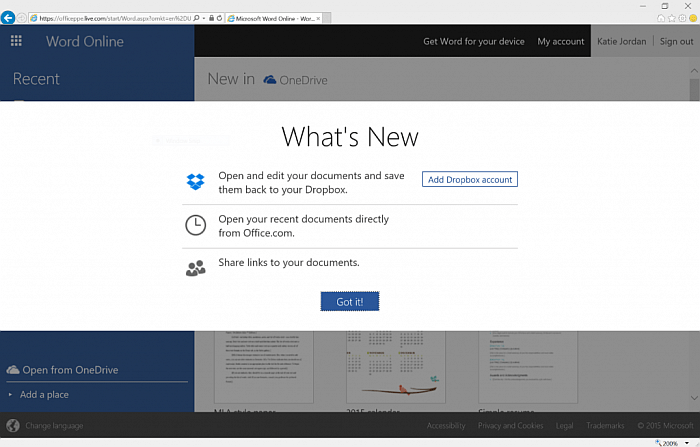 New integration of Office Online with Dropbox saves extra steps for editing and collaboration.